Location: Italian Cultural Center 132 South Algoma St.
* Click "Buy Now" below to Purchase One or More tickets. will be issued for your donation. To educate and increase the public’s understanding and appreciation of the arts by providing performances of an artistic nature in public places, senior citizens homes, churches, community centers and educational institutions and by providing seminars and workshops on topics relating to such performances. 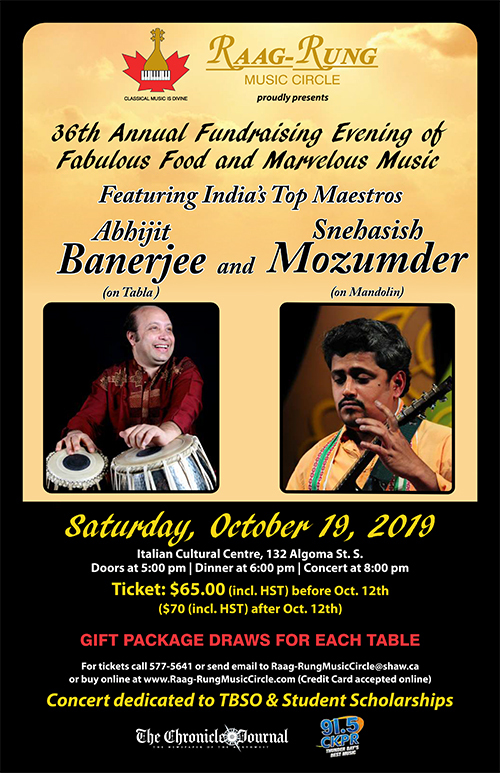 © 2019 Raag-Rung Music Circle. All Rights Reserved.